Well a lot of people have asked me for a true checkerboard heart. So here is not only a true checkerboard heart, but an article about how I cut it. I picked a piece of light pink Nigerian Tourmaline to proof cut this design in for the article. What other color is best for a heart? Pink and red are the two best choices, at least to me. 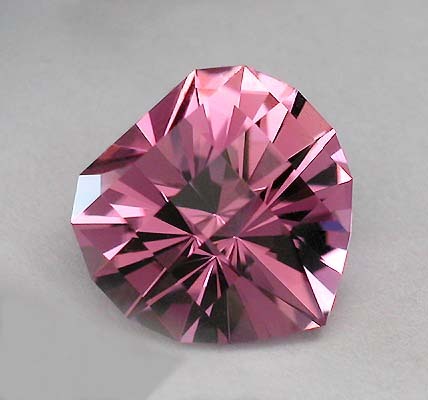 Note: This design would work well in a piece of man-made red Beryl or Alexanderite if you want to cut some thing unique. I would recommend cutting this heart in a larger size just because it is easier to see the checkers and make the design work. I would say 10mm and up it a good size. Top view of the pink Tourmaline rough dopped. 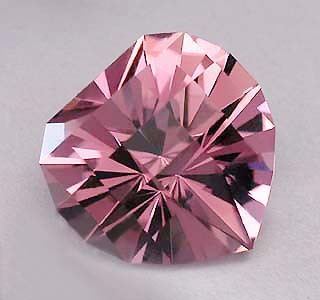 Side view of the pink Tourmaline rough dopped. As you can see the rough is not large and I got quite a good yield from this piece of rough. Note2: It is important when dopping a stone to cut this heart that the point of the heart/rough be at the 96 index (to be cut) if you have a keyed dop. Of course this will vary depending on your machine, just be aware that you may need to orientate the rough. P1 cut in to center point. I have cut P1 in to about where I think the center point is going to be. No I did not use the cam point, I very seldom do, for me it is just easier to cut. But then I have a lot of practice. Note3: Be sure and cut the pavilion centered over the dop, like most hearts. All the pavilion tiers can be cut to 43 degrees to create a temporary center. Then cut to their proper angles. Cut the P2 tier to meet P1 at the center point. P3 is cut to meet center point of P1 & P2. Note4: I have switched to a fine lap 1200, to cut there tiers. On a small stone especially, the angles are close on the pavilion and it is very easy to over cut. Cut the P4 tier to meet P1 at the center point. P5 is cut to meet center point. Cut the P1 through P7 tiers to meet at the center point. It is very important on this design that you get a good accurate center point. An accurate center point lines this design up. The girdle facets and later the checkerboard facets on the crown depend on a good center point (pavilion) to line up easily later on. Note5: You will notice that the P2 and P3 tiers are close in angle to each other and cut fast. Especially if you are cutting a small stone. This is one reason I recommend cutting this design in a large size. Cut the P8(G) girdle tier to meet the P2 pavilion tier. Cut the P9(G) girdle tier to meet the P3 pavilion tier. Cut girdle facets to meet the pavilion tiers. The girdle facets are being cut in to meet the pavilion tiers. Cut all of the girdle facets except for the 48 index facet. As you can see in the picture every thing is lining up. It is important that when cutting this design to get the girdle and the pavilion meet points lined up to each other correctly. The checkerboard crown while not that difficult to cut, definitely benefits from taking a little more time and aliening the pavilion and girdle correctly to each other at this stage. Note6: Like all checkerboard crowns there will be some tweaking and adjusting necessary to get exact meet points when cutting and/or polishing the crown. The 48 Index girdle is cut. The 48 index break is cut to meet girdle. I have cut the P15(G) to meet the rest of the girdle. At this point all of the girdle facets are cut and as you can see it looks like a heart. Note7: On the P15(G), I cut it before the P16 to establish the meet points for the P16. I prefer to polish the girdle first and started with the P15(G) facet. This is a personal preference and you can certainly polish in another order. Or the pavilion first. I just find it easier to always polish the girdles first. I have polished all of the girdle facets and am ready to start on polishing the Pavilion. You might notice that I am only polishing the bottom half of the girdle facets. I am setting the angle at 89.8 degrees or so. There is no need to spend the time and energy to polish the whole girdle facet. It is only necessary to polish the part of the girdle that will remain after cutting in the crown. In other words only polish the part of the girdle you are going to keep. I have polished all of the girdle facets and have polished the P1 facets. Part of the reason I polished P1 first is because they establish the pavilion. By that I mean that when I polished the P1 tier in it gives me a good sharp center point to polish to when polishing the rest of the pavilion tiers. It is helpful to have an easy to see pavilion point to polish to as you go around the pavilion. As you can see in the picture polishing the P1 tier gives a nice defined center point. Next I go around and polish all the pavilion tiers with the exception of the P15. I left the P15 tier for last, it is easier to polish them into a final meet point, when everything else is polished in. As you can see all the pavilion tiers are polished and the pavilion center point is sharp and clear. I also polished in the P17 facet before the P15. This makes my girdle meets sharp and I can just polish (float) the P15 facets in so that everything is sharp and center pointed at both the girdle and the pavilion point. At this stage the pavilion is all polished and ready to transfer. It is a very good idea at this point to examine all the pavilion and girdle tiers to make sure they are all polished. With all the tiers and angle changes on this design it is easy to miss a facet. If you miss a facet and transfer the stone the odds of being able to “find” the missed facet again and polish it are remote. Plus it is a major pain, so always check before taking the dop out of the quill. As you can see, the transfer has been done. Notice that I used the 48 index girdle facet to align the stone after transfer. The reason for this is simple, the 48 index is the longest girdle facet and there fore the easiest to line up. I used a V-dop on the transfer because my center point was not quite centered. And V-dops do not have a key. So I could just use any girdle facet I wanted. Note8: If you are using a keyed dop be sure to align the point of the heart correctly. Remember the transfer reversed things. I am cutting in the girdle breaks tiers. It is important to leave enough crown that you do not cramp yourself when cutting in the breaks. So if anything err on the side of more crown material rather then less. The crown tier on this design, because of the heart shape will look a little different as you cut them in. Tip: I cut all the crown breaks in using 52.33 degree. This is the C7 angle. Doing this makes it easier to line up the crown. After the crown is all lined up, I re-cut all the crown tiers at their respective angles. Cutting the crown breaks around. All of the crown breaks are cut and meet the girdle. Breaks are cut and cutting in the C8 tier. Cutting in the C9, the checkers are coming. I am cutting in the C10 tier and now it is beginning to look like a checkerboard. It is important to cut these tiers slowly. A mistake and/or an over cut at this time will cost you a lot of work and girdle thickness you likely do not have. The points, particularly at the girdle are easy to over cut. All of the crown tiers, except for C13. All of the crown tiers with the exception on the C13 tier have been cut. Notice that where the C13 tier cuts in you can see little points. The C13 tier just needs to be gently rubbed in. They are shallow and will not take much cutting. I leave them for last. All of the crown tiers are cut. All of the crown tiers are now cut in. Also the table has been roughed in. Note9: The table is not cut in the picture above. The flat you see is just the flat spot that was ground on the rough for dopping. Note10: At this point the crown is roughed in and you can see some alignment problems. These problems are minor and pretty typical of almost any checkerboard cut. In other words the checkers do not all line up evenly the first time. However, the checkers will get lined up in the next fine cutting stage and if needed be tweaked during polishing. All of the crown tiers are now cut with a fine lap and I have polished the table. As you can see the checkerboards now are all pretty much lined up. I polished the table at this point because that is where all the meets have to be perfect and the table is the facet that will be most obvious if the meet points are not correct. There is no way to fudge the meets on the table of a checkerboard design, particularly this one. So it is much better to polish the table first and line the checkers up as you polish towards the girdle. As you can see I polished the table first and then worked out towards the girdle. This is a good habit to get into with almost any checkerboard design because you can tweak and align facets as you go along. If you have a problem you can minimize the problem out around the girdle where it will not show. This design is not really all that tough to polish but it will take a little tweaking here and there to get all the checkerboards line up evenly. As you can see in the picture there are a few places that need to be aligned. But the checkerboards are really not as far off as they may look in the picture. The polished checkers versus the unpolished ones, make them appear more out of alignment than they are. The crown on this stone really polished in and lined up with out much trouble and as you can see in the picture of the finished stone the crown is all lined up and square. Typically most checkerboards do take a little bit of tweaking to get all the checkers in an even line. So do not be surprised if you need to do some adjusting during the poinshing stage. This design is fun to cut and every woman I showed it to wanted several, a pink, red, purple. So be warned guys if you show this design to the ladies in your life, you had better plan on cutting a lot of them. I hope you have enjoyed this article and try cutting “Heart Squared” for a different heart and a very neat design.